SR: I was aware that you were ‘The Bevis Frond’s’ frontman, producer and songwriter, but I didn’t know until very recently that you were also a QPR fan. When did you get into the R’s Nick? NS: I’ve loved football since as far back as I can remember. I went to my first match when I was about 8 or 9. My dad had left me and my mum for pastures new, so I never had anyone to take me to football when I was little. A kid at my junior school, Robin Gowing, came from a QPR-mad family, so one weekend they asked if I wanted to come along with them to a game. SR: What was that first match…your favourite players overs the years? NS: So as I was saying, I went along to Loftus Road for the first time with the Gowings and I saw a 3-3 draw against Peterborough. It was about 1964, you can probably check. Mum made me a rosette, which I still have. I suppose, like most young QPR fans in the 60’s, my first real hero was Rodney Marsh. But of course, the side that won the League Cup was a bit special. The Morgan twins were great. Mark Lazarus, Mike Keen etc etc, they were all fantastic players. When Rodney left I was distraught, but they replaced him with my favourite player of all time, Stan Bowles. To my mind Stan was one of this country’s greatest ever players, and he only got five England caps I think. He was a real team player, loaded with flair, but never greedy. A great passer, a hard worker, and one of the deftest finishers, you’ll ever see. It’s 42 years ago, but I’m still pissed off that we didn’t win the league in 75/76. That QPR team was spectacularly good. Gerry Francis was so brilliant. I suppose I’ve always liked the flair players, so it would have to be Johnny Byrne, Wegerle, Les, Trevor Sinclair, and more recently Adel Taarabt, who I thought was absolutely wonderful. I knew he irritated the hell out of a lot of supporters, but he pretty much got us promoted single-handedly. When we left we walked right past a knife fight on the White City Estate. It’s the only game she’s ever been to, and she thought stuff like that happened every week! I was trying to tell her that you don’t get a goal from a 25 yard overhead bicycle kick and a full-on knife fight every week, but I don’t think she really understood just how lucky she was. It could have been a terrible 0-0. She phoned her husband in the USA that evening and said: “Yeah, it was really neat…this dude did a backflip and made a cool goal”. I don’t think he was very impressed. SR: Other memorable games Nick, did you get to Wembley in ’67? NS: Yes, I was 14 and went with my cousin Patrick, who was about 9 years old. My aunt and her family lived on Barn Hill, just up the road from Wembley Park Station, so I thought it would be nice to take Patrick to Wembley. When we got in, Pat was so small that he couldn’t see anything at all, so everyone ushered us down the front, and they actually picked Pat up and sat him just over the wall on the edge of the pitch, quite near the QPR drum. That was probably the most memorable game I’ve been to, though there has been many more throughout my time, Our 1-0 win in the play-offs against Derby was pretty memorable, wasn’t it? SR: Yes, Bobby Zamora and THAT goal! What are your memories of that day? NS: I went with my mate Dave (who’s actually a Spurs fan), but even he went bonkers when Zamora scored. When I got home I had no voice left. NS: His hilarious answer was ‘Rock Bottom’. Cheeky sod! I had to take it on the chin. SR: Did you grow up in West London Nick? NS: I grew up in St. John’s Wood and went to Secondary School in Marylebone. SR: When did you learn to play the guitar and did other instruments soon follow? NS: I started playing guitar when I was 7. My mum was a brilliant pianist, and tried to teach me piano, but I was really into Rock ‘n’ Roll and Pop music at a very early age, and it had to be a guitar. My dad had moved to Germany, and on a visit to the UK when I was 7, he brought me an old Kessler acoustic. I could always play a bit of piano, but the other things like drums and bass came later. SR: Who were your musical influences, what did you grow up listening to? NS: Well, it started with Rock ‘n’ Roll, ‘Johnny & the Hurricanes’, ‘Johnny Kidd & the Pirates’, Gene Vincent, but mostly ‘The Shadows’. Then when ‘The Beatles’ came along, I instantly became a fan. I loved the Beat era, bands like ‘The Who’, ‘Stones’, ‘The Kinks’, ‘Small Faces’. My mum took me to see ‘The Beatles’ at Hammersmith Odeon for my 10th Christmas present and I saw ‘The Stones’ at the Albert Hall in ’66. But then I remember seeing Hendrix on ‘Ready Steady Go’, also in about ’66, and he just blew everyone else out of the water. So when the Psychedelic scene came along I was about 14 and I totally went for it. I went to the Marquee for the first time in ’68 when I was 15 and saw this new band called ‘Jethro Tull’, supported by ‘Black Cat Bones’ and that pretty much changed my life. I spent the late 60’s and early 70‘s going to gigs, getting off with girls, and watching and playing football. Heaven! My two dreams were: (a) to be a professional footballer and play for the R’s, and/or: (b) to be a professional singer/songwriter/guitarist. 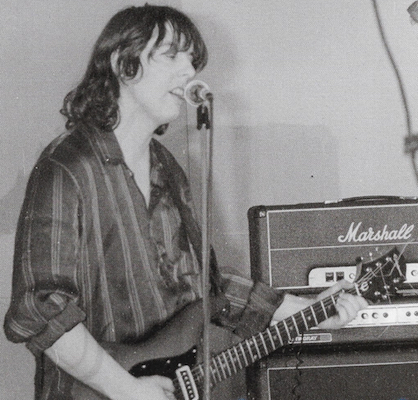 Fortunately for me (and QPR) I was a far better musician than footballer. The best I ever managed football wise was playing in Division 3 of the Camden League, and I once scored two goals playing for the ‘Daily Express’ against the ’Daily Mail’ at Dunstable Town’s ground! A mate of mine was a journalist, and they were short of players. I honestly still dream about that. A shot from a tight angle, which beat their keeper at the near post, and a first time half -volley on the run. How tragic is that? SR: What was your first band? NS: That would have been in ’68 when I was still at school. Initially it was called ‘The Museum’ and featured me on guitar, Ray Flores on bass (who I still play 5-a-side with every week, Charlie Webber on vocals, and Bill O’Brien on drums. We played at Youth Clubs and parties, and took our gear to gigs on the bus! Charlie’s elder brother, Steve, was the organist of a real Psychedelic band called ‘The Geranium Pond’, and if we were lucky we could occasionally borrow equipment. However, although Charlie looked good, he wasn’t a great singer, so we went down to a 3-piece with me on vocals and guitar. Around this time an old schoolmate, Julien Temple (now a famous film maker), suggested we name the band ‘The Bevis Frond’. I never knew where we got the name from, but we became ‘The Bevis Frond Museum’. After a while, Bill, who was way too good for us, left to join his cousin’s band, who were called ‘The Confusion’. His cousin was Gary Grainger who ended up in ‘Strider’ and then joined Rod Stewart’s mid to late 70’s band. When I started doing my own stuff in the 80’s, I used ‘The Bevis Frond’ name, because I always thought it sounded great. I know now that it means ‘Fern Twig’. A ‘Bevis’ is a variety of fern, and a ‘frond’ is, well, a frond. SR: Do you still tour Nick? If so, what is the usual make-up of the band? NS: Occasionally, but recently, we’re in the happy position of just being able to do gigs that sound interesting. So it’s more like one-off shows and festivals these days. But if we got a good offer to tour, we’d definitely think about it. SR: You started up your own label, how did that come about? NS: Necessity. No labels wanted to put out any of my music. I was playing in a band in the late 70’s, early 80’s called ‘The Von Trapp Family’, and we were gigging a lot round London. We played on John Peel’s radio show, and we saw almost every record label in Britain, but no one was interested in signing us, so we put out an EP on our own label, Woronzow, named after a street in St. John’s Wood. SR: Apart from amassing a large record collection, I read that you also own a Record Shop. NS: My record collection isn’t that big any more. I honed it down to just the stuff I really love. Yes, I run a second-hand vinyl shop in Bexhill-On-Sea. Great fun. 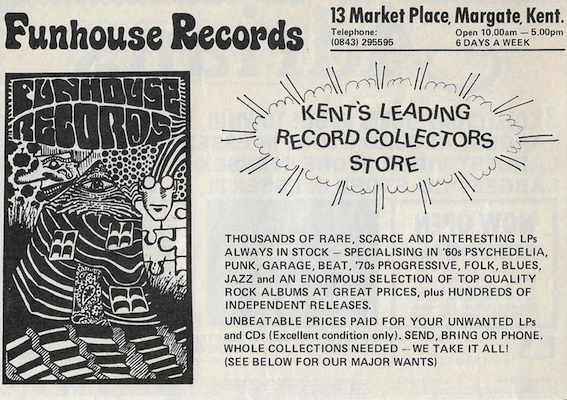 SR: I also saw a mention somewhere of Funhouse Records. I remember those guys from various Record Fairs in the 80’s and I was also on their mailing list for a while. NS: I always give Funhouse a mention, because when I did the first Bevis LP (on Woronzow), they were really instrumental in publishing it. They bought (and sold, I’m glad to say) a load of copies, wrote about how good it was in their list, and that really started the ball rolling. Without Funhouse, I would have found things a lot more difficult. SR: I see that your albums can still fetch high prices Nick. NS: Shame I didn’t keep multiple copies of each one! I did cleverly save three of everything. And some titles I’ve now only got one or two copies. SR: Are you recording anything at the moment? NS: I’m planning to go into the studio in the next month or two to record a new album. SR: What inspires you to write? Is it the same as it was when you first started out or has it become more difficult over the years? NS: I’m incredibly lucky in that I’ve never found it difficult to write songs. I think you just have to stay true to what you’re about, don’t try to modernise your sound, because that always sounds awful and contrived. I guess lyrically I tend to write more about getting old and dying, but I try to do it without sounding too mawkish or depressing. Admittedly a lot of what I write goes straight into the bin, but occasionally a good one comes along, and when I’ve got an album’s worth of good ones, I’ll think about recording. I don’t get too bothered about writing. If something comes that’s great, if it doesn’t, I don’t worry about it. SR: Back to the Rangers, do you get to many games? NS: I’m a season ticket holder. SR: Mick Jones, Glen Matlock, Pete Doherty, Andy Miller of Dodgy, Emily Capell are all well known R’s fans. Bruce Welch used to be a regular and Phil Collins now seems to support everyone. Robert Elms and the composer Michael Nyman are also fans of course. Are you aware of any others in the business? NS: Keiran Prendiville (off of Esther Rantzen’s show back in the 80’s), sounds of barrel being scraped! I used to sit behind Bruce Welch, so I bagged him for a magazine interview about ‘The Shadows’. He was a really nice bloke, and probably still is. SR: Can you tell me about the radio show you host? NS: I’ve been doing a weekly show with my mate (and BF guitarist) Paul Simmons for WMBR, Boston, USA, for about 7 years. We just did Show No. 400. We record it in my basement and send it over to Boston for the Friday morning slot. We have a completely open brief, and just play anything we like, and talk a lot of old tosh, which seems to go down pretty well. I absolutely love doing it. SR: What else are you up to these days Nick? NS: Wow, running a shop, recording music, playing in a band, 5-a-side every Thursday, I reckon that’s enough for a man of my years. SR: Many thanks for taking the time to do this interview for the Indy R’s website Nick and good luck with all your future projects. NS: Thanks Steve, hope this is okay. That is a great interview well done Steve and Nick comes across so well. Admittedly I’ve never heard of him but what a great interview. It’s really nice to hear people havn’t lost their love for the Rs after half a decade plus……..and Steve , your background knowledge of the interviewee, excellent.